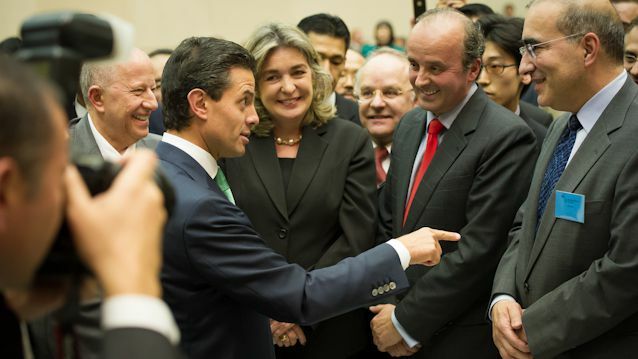 On Tuesday 9 April 2013, Mexican President Enrique Peña Nieto delivered the 21st U Thant Distinguished Lecture at the United Nations University Headquarters on the occasion of his official visit to Japan and first visit to Asia since he assumed office in December 2012. President Enrique Peña Nieto introduced his vision for enhancing Mexico’s role on the international scene and more specifically its presence in the Asia Pacific region. He highlighted how the policies his government is implementing are aiming to foster a prosperous Mexico during his presidency. On the topic of education, President Peña Nieto argued that while there has been great success in promoting basic education in Mexico, the emphasis should now be on improving quality of teaching and expanding access to higher education. Only by reducing inequality and investing in high quality education can Mexico become an inclusive and prosperous country with continuous economic growth. In order to enhance economic stimuli, Mexico is implementing macro-economic measures such as minimizing public debt, bolstering state reserves, lowering the inflation rate and aiming for an interest rate of around four percent. In accordance with these pro-economic growth measures, the President’s government presented to the Congress a zero fiscal deficit compromise, which aims to responsibly use public budget; the budget was consequently approved. Focusing on the subject of Mexico on the international stage, President Peña Nieto commented that Mexico will continue to increase its presence in the world, acting as a country that champions international law, promotes free trade and contributes positively to the development of international world order. The President emphasized that in a globalized world, development and prosperity needs to be shared between all partners. He assured that his government will do its best to be an active and responsible global actor that will help to boost development and cooperation between nations. President Peña Nieto’s speech was followed by a lively question and answer session, moderated by UNU Senior Vice-Rector Kazuhiko Takeuchi. During the session the President addressed a number of queries from the diplomatic corps and audience related to education reform and the TPP. Regarding the TPP, the President responded that the pact will allow Mexico to further consolidate its strategic alliance with members. Should Japan join the agreement, there will be more potential to maximize bilateral relations given that Mexico is Japan’s number one socioeconomic trading partner in Latin America. The President concluded his remarks by stating that everyone is to expect clarity and transparency from the Mexican government on all matters. With its new compromise, Mexico will strive to enhance its role as a responsible global actor.